The Beicheng high-speed train station in central China’s Hefei City looks impressive enough with its 1,000-square-meter passenger hall, four platforms and eight rail lines. The six-year-old station is also mostly deserted. On one recent day, a visiting local official counted just six passengers using the station. Only two trains stop there each day – down from four not long ago – delivering an average of eight passengers. Once expected to attract high traffic volumes, the Beicheng station stands as a monument to rash planning during China’s years of ambitious railway expansion. The local government acknowledged last year that the station had never made ends meet since its opening in 2012 and that it was at risk of being closed down. Railway planners simply built too many stations in some parts of China and often chose inconvenient locations, transportation experts say. For example, along the 301-km intercity line between Shanghai and Nanjing there are 21 stations, with 10 more available for future use. As a result, three stations have only one pair of trains stopping daily. The central government has come to realize the risks of railway station overcapacity. In May, the National Development and Reform Commission (NDRC), China’s economic planner, issued guidance on “reasonable development” of high-speed rail stations and warned against building stations far from downtown areas. The central government has ordered local governments to be more prudent in approving urban development projects associated with high-speed railway stations as part a broader effort to rein in runaway local transit investment. 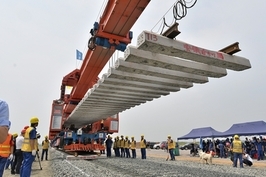 Last year, the central government blocked multi-billion dollar subway projects in Baotou and Hohhot, both in Inner Mongolia. In Beicheng, a district with a population of 400,000, residents complain that they can’t use the station to catch high-speed trains because there are hardly any public transit connections. Instead, passengers travel at least 30 km to other stations that are overcrowded. Meanwhile, the local bus company says it cannot open more bus routes to the station because there are not enough passengers. 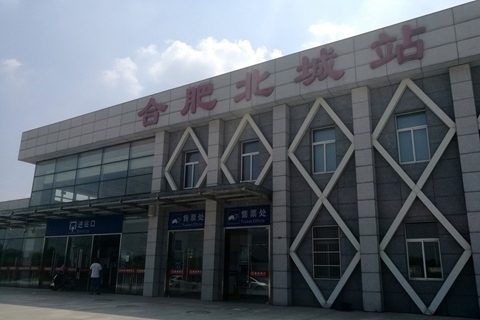 Beicheng station is one of six on the 130-km rail line connecting Hefei, the capital of Anhui province, and Bengbu, another major city in the province. Within the same county of Changfeng, there is another station 50 km away that handles 30 trains daily. Two high-speed railway stations in a county with 660,00 people is rare even in China, Liang Feng, the head of Changfeng County’s High-speed Railway Office, told a local newspaper in 2012. But the Ministry of Railway approved the plan for two stations in Changfeng mainly because of the elongated shape of the country, Caixin learned. The rationale was that, if only one station were built in the middle, it could not conveniently serve both the north and south ends of the county. It was also hoped that the Beicheng suburban area would become another urban center as it was to be integrated to the urban area of Hefei. Local planners projected that the station would draw more business and investment into the area, but that has yet to materialize. Plans were once made to improve the accessibility of Beicheng station. A bus transit hub with expected daily flow of 20,000 passengers was slated to be built nearby before 2010. But construction of the hub is nowhere in sight eight years later. 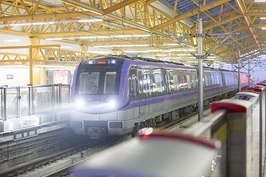 A plan to extend Hefei’s Subway Line 5 to Beicheng station was scrapped in 2015. Beicheng station’s best hope now is that, once another high-speed rail line connecting central China’s Shangqiu, Hefei, and east China’s Hangzhou is completed in 2020, it can serve as a transfer station and generate increased traffic. 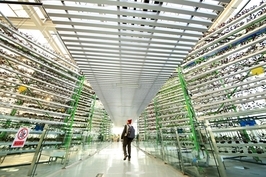 Sun Zhang, a professor at Tongji University and an expert in railway engineering, attributed Beicheng station’s idleness to poor planning of railway stations. The average distance between stations on a high-speed rail line should be 30-50 km if the train is to operate at designed speeds of 250-350 km per hour, Sun said. With six stations on the 130-km Hefei-Bangbu line, the average distance between two stations is too short to allow stops at all stations. According to railway experts, many local governments prefer to build stations in less-populated suburbs because of lower development costs. Governments also often hope that a new station will draw investments to the suburbs and expand the urban core. In some cases, stations are built in a suburban area between two cities as a compromise. As both cities compete for siting, a higher-level government would finally locate the station in the middle to balance the interests of both, compromising public accessibility. Construction of railway stations is also seen as a driver of real estate development. A common practice of railway station developers is to promote real estate projects near the stations, which often comprise large complexes of residential and commercial properties. The NDRC’s guidance warned against overoptimistic estimates of railway stations’ economic benefits, especially for smaller cities. It advised that smaller cities should avoid copying the practices of large cities and differentiate their strategies in developing the surroundings of new railway stations. Local governments may face financial crises down the road if their railway stations fail to generate projected revenues to service debt. The guidance urged that local governments review their development plans for new railway stations and correct any problems.